Reality had no more to do with La Mer than the Hokusai woodblock print on the cover of the first edition. Achille-Claude Debussy, staying in a still treasured room at the Grand Hotel in Eastbourne, should have been inspired on his balcony at a raging sea, with storms, huge waves, churning tides and manic colors. But no, the sea at Eastbourne is tranquil, calm, pacific. Debussy’s probably never glanced at the water here. His “sea” was inside that deft and other-worldly inspirational process. La Mer also was the opening an all-French opening program by the London Philharmonic Orchestra (LPO) this afternoon. In fact, it was the ideal program for New York’s first balmy spring Sunday, and even an oncoming storm was given its torrential hints by that first work. 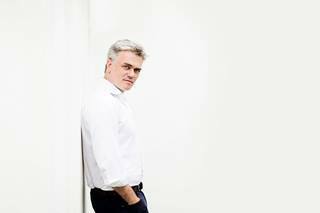 Conductor Edward Gardner handled all three movements perfectly well, for the LPO is a splendid orchestra. Yet at the end of the concert, neither the conductor nor the orchestra was as memorable as those absolutely gorgeous first-chair players. One wasn’t concerned with the orchestra so much as the soloists. Neither Debussy nor Ravel were overly occupied with the classical physicality of their music. That comes tomorrow night with Mahler and Beethoven and Sibelius. Rather, they were painters, and each tint, each color was painted with flutes and piccolos, with ravishing brass chorales (in the finale of La Mer) or the inner oboe Arabic songs of Ibéria or in the solo violins and harps of Ravel’s Mother Goose suite. And oh, does the LPO have the soloists for that. Conductor Gardner can whip up his orchestra to an ensemble frenzy when necessary. Yet at the end, one remembers those solos of woodwinds, or horn and trombone. Mr. Gardner is enjoyable to watch and hear, yet in both Ibéria and La Mer, one missed the idiosyncrasies which give the atmosphere to both. Ravel used to say that one need only play the notes as written, but Debussy needed more sweep, more retards, more of those...well, those dream ideas which can bear no name. La Mer breathed and roared in the opening, that ravishing cello consort both whispering and singing, that tympani adding all the needed power. Yet this and the wonderfully titled “play of the waves” was episodic. One admired the players, one enjoyed the crescendos, the tempos were right. But it was music, it was not the sea. For Ibéria, the LPO was finally wound up, I doubt whether Debussy ever went to Spain, but Maestro Gardner started and finished with the Iberian/Arabic rhythms from his mind. The colors were transparent, the solos were magnificent. The middle movement lagged a big, but one could appreciate the orchestration. Debussy was a series of dreamscapes. Ravel, as always, was a story. Or in this case, five stories from Mother Goose, each painted so sensitively, every measure an individual bijou. Again, until the final “Fairy Garden”, slowly, immaculately built up, it was pleasurable for the audience. But children, for whom it was written, were nowhere in the hall this afternoon, and I doubt whether they would have been moved. The best was so good–so overwhelmingly lilting and liquid, with such breathtaking breadth–that nothing could compare to it. I’ve always loved Jean-Efflam Bavouzet’s Debussy solos, so technically daring, shaped like Rodin sculptures. But when he played Ravel’s G Major Concerto this afternoon, I couldn’t believe the transcendent joy, real joy in the entire work. First, Mr. Bavouzet had so much fun. His arms and hands played games with the piano, he nodded appreciation at the players. His octave runs, his nuances, his trills, and the lovely nostalgia of the second movement were more than thrilling, they were personal for the soloist. Technically, they seemed like a walk in the park for those fingers. Emotionally, he was running through cities and forests together. I have heard the opening movement with more sentiment. But from the first slap-stick snap, it never occurred to Mr. Bavouzet that one should bring in extra expression. Ravel knew what he was doing, and no pausing for “inner depth” was necessary. That was for the second movement. And even here, Mr. Bavouzet restrained himself. Such graceful notes, so understated the feeling, that he only followed Ravel’s direction, as Mr. Gardner guided his orchestra to its finish. Every pianist takes Ravel’s Presto to the nth degree. Ravel ducked out from playing the premiere because he probably–like Jack Nicholson–“couldn’t handle the ruthlessness”. Mr. Bavouzet not only handled it, but he did the impossible. The music was more than transparent, each note soared above the other note, he set fire to the themes, exploded the music, blew out the flames, set the music on fire again. And to him, it was all child’s play! 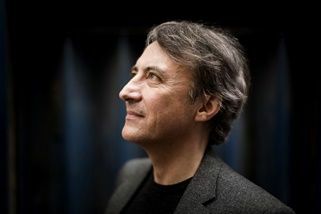 Ravel famously said, “The only love affair I’ve had is with music.” I have no idea what Jean-Efflam Bavouzet’s personal life is, but for 20 minutes this afternoon, he shared his ecstasy with Ravel, with the piano and–oh blessed day!–with we so enraptured listeners.